The paint and wine trend has taken Georgia by storm, proving that anyone can be an artist with a little guidance. Paint and wine is an artist-led event where the public can enjoy snacks, sip wine, and channel their inner Picasso. This is an excellent way to spend a night out with friends. Even if you don’t have any artistic talent whatsoever, you can hone your skills at one of these 10 best spots for paint and wine in Georgia. This independently-owned studio provides step by step instruction for painters of all skill levels to create their very own version of a masterpiece. You can book the whole studio for party or simply grab an empty slot during one of their classes. They’ve got plenty of beer, wine, and snacks as add-on purchases, so take advantage and get the most from your experience. Full house painting rocks for Hurricane Harvey. Standing room only now. Channel your inner artist with this energized environment. They can help you learn valuable art skills and hone your technique, even if you’ve never painted before. As the name implies, the studio offers much more than art creation. Their main goal is help you learn while having fun and helping you achieve what you maybe never thought possible. This popular chain of painting studios features some of the most creative designs in the paint and wine trend. With every piece carefully crafted, you’ll leave with a work of art worthy of a space in your home. Aside from general painting classes, they also specialize in corporate team building events, private parties, and even sessions just for the kiddos. This charming studio caters to both adults and children alike. You can reserve the studio to host your child’s next birthday party, or grab your closest friends for an evening of creating and admiring art while sipping your favorite vino. On the weekends, the studio also offers a small plate menu, but food and seating is limited so it’s best to reserve your spot ahead of time. You’ll be raising your glass over and over as you work on your beautiful masterpiece. Perhaps some of “happiest hours” in the state, A Toast to Art focuses on making learning fun and easy in a no-pressure, enjoyable atmosphere that will have you visiting again and again. Best of all, you get to bring your own wine so you’re sure to have the exact wine that suits your tastes. If you’re ready to explore your creative side, the experts at Cork & Canvas can help you unleash your talents. 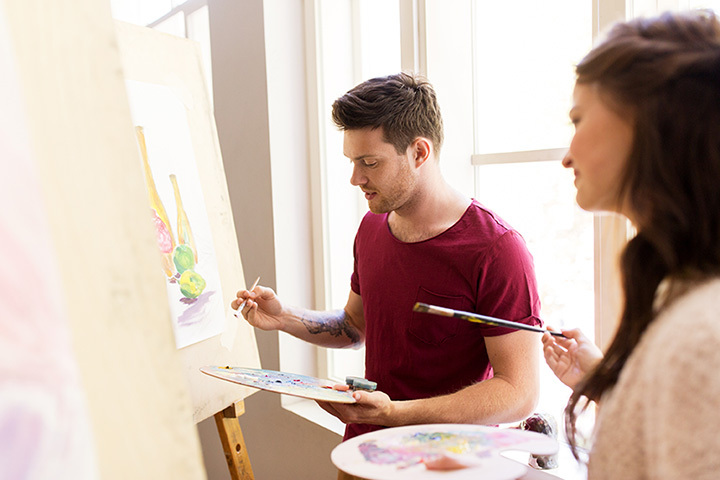 In a relaxed atmosphere, you can learn how to paint like a pro in no time while enjoying the company of friends new and old and sipping on your favorite beverage. This place is one of the most established studios in the Atlanta area, yet it still manages to offer new and exciting experiences every time. The name says it all: this art is all about you! Feel free to add your own touches as you follow the instructor’s brushstrokes to create a truly unique work of art. If you can’t make it to the studio, they can bring the studio to you via mobile events. These are perfect for private parties and corporate team building events. Just make sure you BYOB before you head to the easel. This large chain of paint and wine studios has several locations throughout the Peach State, and each one excels at helping guests create memories and masterpieces. Their “mixers” can help you make new friends while mingling with your old ones. In addition, you can book private parties that include studio rental, private instruction, and all the supplies you need to craft beautiful artwork the whole group will enjoy. Just bring your family or friends and leave the rest up to them! This studio covers everything you’ll need for a night of fun, including supplies and expert instruction. They occasionally feature classes specifically for kids to practice their skills, but most of the events here are geared for teens and adults. You can purchase beer, wine, and other refreshments for a small fee to get the most from your night of creativity. Colorful and creative, this art studio is all BYOB to ensure you get exactly what you want. They feature art classes throughout the week, along with art camps for kids and the ability to book private parties or company team building events.